Linda releases a Merlin she helped rescue. 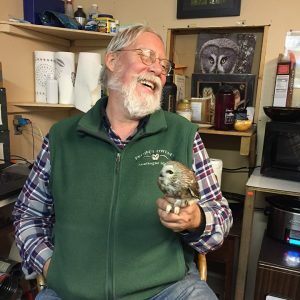 When I was first approached by the Thunder Bay Audubon Society’s board about offering a donation in memory of their devoted, long-time president, Linda Jo Klemens, the first idea they brought to the table was a memorial gift that would go towards the cost of a Snowy Owl transmitter. These solar powered GPS-GSM transmitters made by Cellular Tracking Technologies cost nearly $3,000 a piece. They record locations in three dimensions (latitude, longitude, and altitude) at programmable intervals as short as every 30 seconds, providing unmatched detail on the movements of Snowy Owls, 24 hours a day. Truly, the collaborative work of conservationists, scientists, and organizations — particularly Project SNOWstorm — has proven worthwhile in gathering more data about Snowies and in better meeting their needs, particularly as they face the serious impacts of climate change. The WPBO Motus tower supports migration research. However, the cost for one transmitter alone made this path a limiting one. As we continued to explore options, I was aware of the pressing need for funding something very tangible and long-term that would have a direct impact on bird conservation and research: a Motus tower at WPBO. The idea of sponsoring the purchase of a transmitter for a Snowy Owl in Linda’s memory was wonderful and this research is undoubtedly important, but the possibility of moving an on-loan Motus tower from our spring owl banders’ home in Paradise, Mich., to the base of our owl banding operations at the Owl’s Roost at Whitefish Point Bird Observatory seemed a very fitting and long-lasting memorial for a person who was so invested and committed to birds. Friends gather before the dedication ceremony. 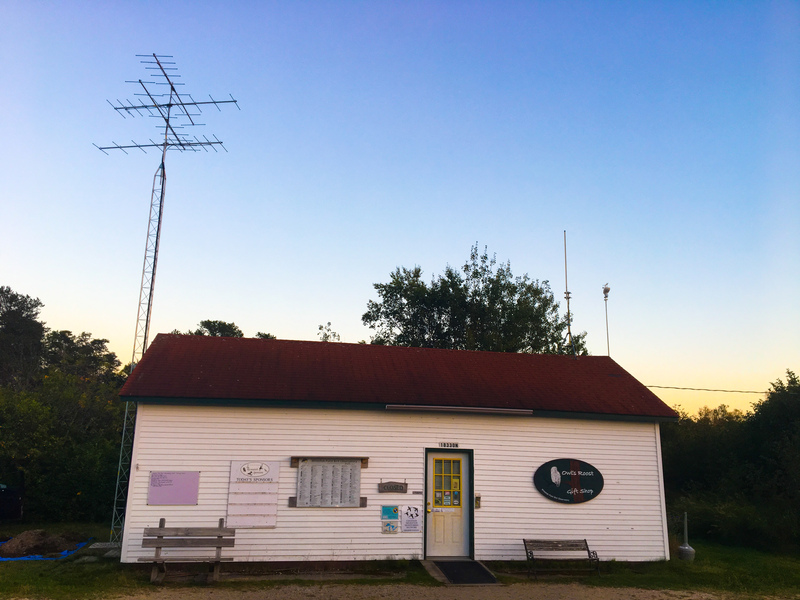 Thunder Bay Audubon Society’s board of directors liked the idea as well and Michigan Audubon matched their gift in order to make the Motus tower’s permanent move to WPBO happen. There are many people to thank here; it turns out, it takes a village to raise a Motus tower. Suffice to say, the work was completed through collaboration, tenacity, and a true investment in this technology and what it means to put WPBO formally on the map of the international Motus network. Even the cement base of the tower pays homage to owls, as stones were arranged in the shape of two owl silhouettes. 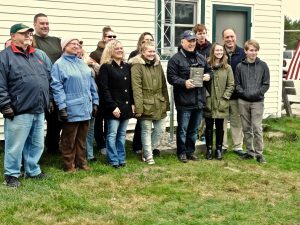 A plaque that dedicates the tower to Linda’s memory was shared on Sunday and will be affixed to the side of the building so that visitors to the Point can witness Linda’s impact to bird conservation. Dave Brinker holds a Northern Saw-whet Owl. Chris Neri, our fall Field Ornithologist, also spoke at the event, sharing some of the backstory behind the loaning of the tower. In 2017, David Brinker, Project Owlnet cofounder, visited WPBO to install the on-loan Motus tower at its then-temporary home, which also happens to be the home of our spring owl banders, Chris Neri and Nova Mackentley. Dave also brought with him nine Project Owlnet nanotags for the banders to put on Saw-whet Owls. 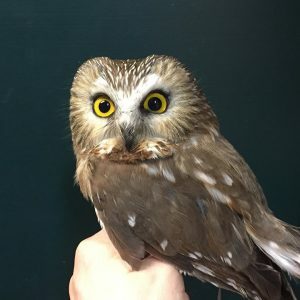 If you’re familiar with WPBO’s owl banding history and the research that’s been possible through long-term banding of these owls, you know this species is one of particular interest. Apart from meeting our monitoring and research interests (birds), our participation in the Motus Tower network allows other researchers to consistently follow and understand the movement patterns of other small animals — from birds to bats to large insects. When I pulled into the parking lot at Whitefish Point on Sunday, October 7, there were already a few dozen people gathered around the bird feeding area and the Motus tower itself. While we waited, the trees and grounds near the feeding area outside the Owl’s Roost were busy with the activity of White-crowned Sparrows, Pine Siskins, and — of course — Black-capped Chickadees. Several photographs of Linda lined a table at the event — photos of her pointing out birds to children, photos of her with birds, photos of Linda birding. Linda was, through and through, a bird lover and not only for their beauty and for what birds meant to or gave to her personally, but for birds in and of themselves. 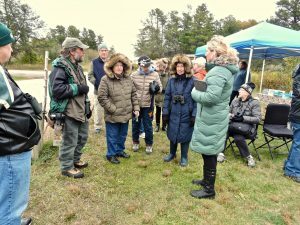 She struck me as a natural educator and conservation-oriented birder, as well as someone who couldn’t resist offering a nugget of bird ID tips to anyone who would listen. The moving, memorable, often humorous stories from family members and friends demonstrated that entirely. Linda’s family members gather for the tower dedication in her memory. Linda’s husband, Craig, told me the story of how she once found an injured Merlin. Linda quickly located a certified rehabber and the two of them drove it downstate together so the bird could receive necessary medical attention. After the Merlin was mended and ready for release, the rehabber gave the bird to Linda and instructed her to release it. One of the photos at the dedication was of her releasing that bird; her face held the expression of connection, awe, and pride. It wasn’t just because she was holding a bird of prey; it was because she was following through on an act of care, of giving back to birds, that filled her with meaning in that moment. 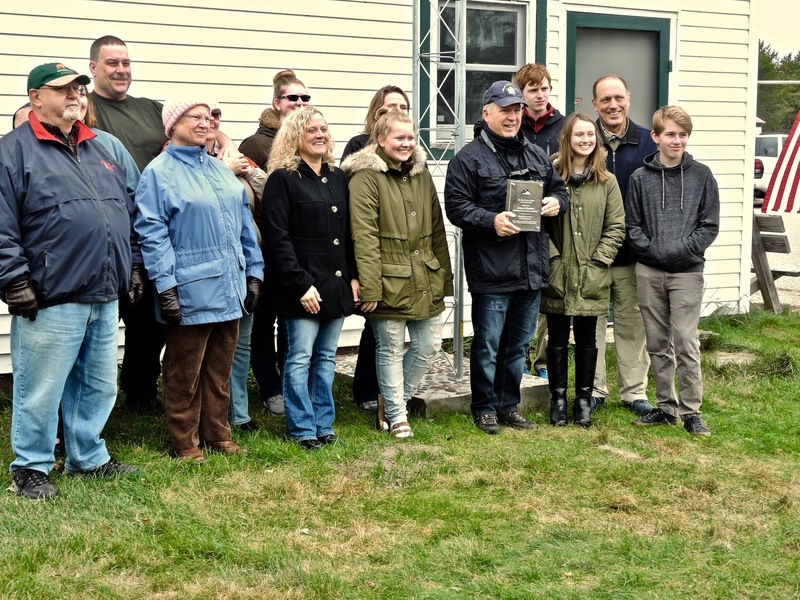 It was a meaningful experience for me to see the turnout of people at the Point that seemingly winter day in October, to formally dedicate the tower to Linda’s memory, to hear stories celebrating her spirit, and to connect birds and people. It is events like these, people like these, who come together with a love of birds and a commitment to their conservation, who come together with intention and care to give back and to do the best they can to be an example. As I shared with the group on Sunday, I can’t think of a more suitable, lasting, impactful memorial gift than a Motus tower at this particular site. Its presence and capacity translates to innumerable potential advances in understanding and protecting wildlife and birds. Growing up in the forests and fields surrounding Hubbard Lake, Linda Jo Klemens was an avid conservationist from her earliest days. Nurtured by her family, she spent many days with sisters and friends exploring the woods, wetlands, and big lake together. 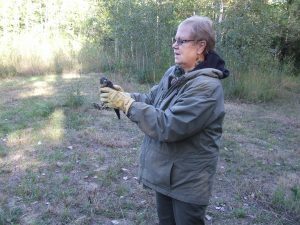 Linda was active in the Thunder Bay Audubon Chapter for most of her adult life, serving as the President for the past twelve years. She was led into the Audubon by her mother, Violet Snyder, and grandmother, Beatrice Gerow, who were founding members of the chapter. Linda shaped the chapter’s schedule to ensure that it always had exciting programs, frequent events and top notch special guests. She also worked hard to reach groups across the community including churches, schools, service organizations and others in order to share her knowledge and passion. Linda was known as an excellent guide, excelled at birding by ear and had especially keen eyesight. Many friends and her entire family have stories of being on a drive when she would suddenly blurt out, “Stop! Back up. There is a (species) on a bush back there.” Sure enough, upon backing up to investigate, there would be a bird that everyone else had looked past sitting exactly where she said it was located. She relished combining her love of travel with bird watching. 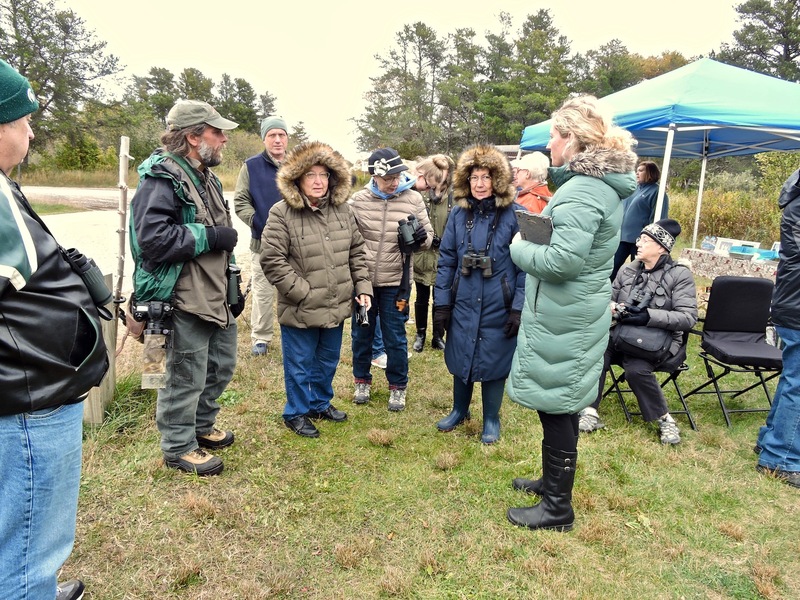 Together with Craig, her husband of fifty years, she traveled across the United States spotting shore birds, migratory birds, endangered birds, regional species and reported rare sightings. Whether they were spending a week at Bosque del Apache in New Mexico or a day stalking red-cockaded woodpeckers in a North Carolina pine forest they were happiest afield with their binoculars. During two trips to Europe they birdwatched across Germany, Switzerland, France, Belgium, Great Britain and Ireland balancing history, sightseeing and all manner of local beauty. Another trip to Alaska was a mix of cruising and driving an RV across the state while stopping to gaze and admire the giant landscapes and Alaskan birds. Finally, a week in Costa Rica spent mostly at remote parks with a personal guide allowed them to see over one hundred-thirty tropical species in the rainforests. They were planning another adventure to Hawaii for three weeks of birding right up to her hospitalization. Linda was also active with the Alcona Historical Society, the Alpena First United Methodist Church, Lady Learners and Extension of Hubbard Lake and the Hubbard Lake Sportsmen’s Association. Besides her husband Craig, she is survived by son Darren (Molly), daughter, Laura, and five grandchildren: Ellyssa, Abigail, Jakob, Benjamin and Alexandra; and two sisters: Sidney and Alexis.